Contex has been designing and manufacturing specialty lenses for over forty years. Those patients who have extreme cases of astigmatism, have had some type of surgery or some eye trauma may not be able to see without these type of lenses. Contex Specialty lens designs include toric base curve, bi-toric and non-symmetric post-surgical and post-trauma lenses. These lenses are some of the most advanced lens designs in the world. They often give a smoothing effect to the cornea that can improve your vision, with and without your lenses. If you have excessive astigmatism, have had refractive surgery or some other eye trauma Contex specialty lenses will most likely improve your quality of vision. How Do Toric and Specialty Lenses Work? 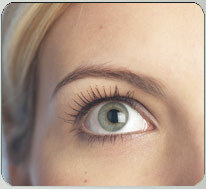 Contex toric and specialty contact lenses are designed to fit the specific shape of your eye. Contex Toric lenses are generated using the most advanced non-symmetric machine. This machine is able to make a square zone within a round lens. in much the same way as modern mag wheel except the tolerance levels are a hundred times that of mag wheels. These lenses also feature excellent surface quality that gives you the highest quality optics available. They can also help reduce the amount of astigmatism through your lens resulting in crisp visual acuity letting you see clearly all day. The edges of every lens are machined to allow easy and exact duplication of in all aspects of your lenses. While most GP lenses use two or three curves to make a edge, Contex lenses feature a “True” Aspheric peripheral design that looks much like the tip of a ski. This allows for more comfort. Toric and specialty lenses may require several office visits to be fitted as they must be custom ordered and fitted by your eye care specialist. Your personal motivation can greatly affect your success as there is a brief (1 day to 2 weeks) adaptation period in most cases.